Google today announced it is introducing, over the next few weeks, a series of short surveys in English-speaking countries which will appear after a user mutes an ad. The company says its goals are to learn why users mute ads, serve better ads, spot publishers and advertisers in violation of its policies, and help improve overall ad and placement quality. Google introduced the small [X] mute control button in the top right hand corner of most of its display ads last year. Since then, the company says users have muted “millions of ads” and the company has used these signals to make ads more relevant and useful. Now it wants more information on which ads aren’t working. The technology behind Chromecast, Google’s tiny $35 dongle that allows viewers to stream content to their regular TV from a smartphone, tablet or laptop, is also coming to Google TV. Chromecast seems like an effortless solution for watching content stored online by high-profile streaming services such as Netflix and YouTube. Similar to Apple TV though, Google TV has a much wider range of apps and services built right into the box – no secondary device required – and acts as an intermediary for users’ existing cable or satellite TV hardware. A bit like what Microsoft is planning with the Xbox One. 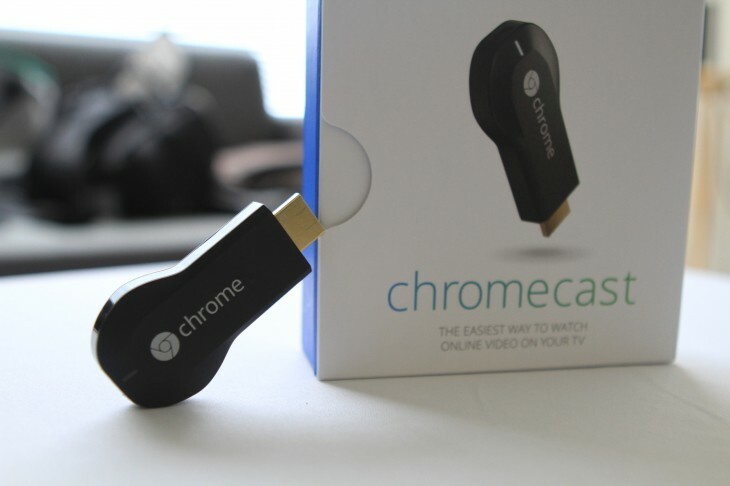 Chromecast will therefore not replace Google TV. At least not yet. Sundar Pichai, Google’s SVP for Android, Chrome and Apps, emphasized how the two would co-exist in an interview with AllThingsD yesterday. He said Google TV would soon “be a full-fledged Android for television” and expected to announce new partners at the CES industry trade show next January. Bundling Chromecast’s streaming technology into Google TV will make the latter a far more compelling product and also appease existing owners. It likely won’t be enough, however, to make Google TV the breakout success that the technology giant has always dreamed of. The true test will be if and when Apple launches its much rumored and highly anticipated Apple TV successor. Google will need to be able to offer a solid counter-argument; Chromecast support should be but one part of its marketing artillery. On the heels of the unveiling of Google’s new Chromecast TV dongle, The Wall Street Journal is reporting that the company is developing a more feature-rich set-top box that would include a video camera for Hangouts and a motion sensor. According to the newspaper’s sources, a prototype of the device was showed off behind closed doors at CES earlier this year. It was clear from Google’s event this week that Chromecast is just one piece in the puzzle to occupy the living room. The company confirmed that the Google TV platform will get support for the Chromecast streaming technology. Google SVP for Android, Chrome and Apps Sundar Pichai told AllThingsD on Wednesday that Google TV is soon to be a “full-fledged Android for television”. He also teased that more partners would be announced at next year’s CES. The Journal went on to note that it was unsure whether Google has continued work on the set-top box prototype, which was said to have access to Android games and the Google Play Store. At the least, the overwhelming customer response to the Chromecast, which originally came with a generous Netflix promotion that quickly sold out, should help validate the Chrome and Google TV teams’ efforts to augment the TV. With Microsoft billing its next-generation console as an “all-in-one entertainment system” and Apple tinkering with its Apple TV hobby, Google will find itself up against serious competition next year as it moves forward with Google TV. Still, it’s a trillion-dollar market, so it’s not likely to get too crowded soon. Google has extended its Street View imagery to the top two viewing decks of the Eiffel Tower for the very first time, giving users a breathtaking view of the Parisian skyline from the famous French monument. The Eiffel Tower is the most visited monument globally – some 7 million people visit and ascend the monument each year – but Google is now opening the iconic structure up to absolutely everyone on the Web. Google employees took the Street View trolley, an image capturing device that looks exactly as you would expect, to both the second and top floors to capture the entire circumference of the viewing decks with all-new 360-degree photographs. The results are breathtaking and still trigger an inevitable sense of awe; it was the highest monument in the world for 40 years, although that title is now held by the Burj Khalifa in Dubai – a building which Google has also scaled for its Street View image library. Google has begun experimenting with encrypting Google Drive files, a privacy-protective move that could curb attempts by the U.S. and other governments to gain access to users’ stored files. Two sources told CNET that the Mountain View, Calif.-based company is actively testing encryption to armor files on its cloud-based file storage and synchronization service. One source who is familiar with the project said a small percentage of Google Drive files is currently encrypted. The move could differentiate Google from other Silicon Valley companies that have been the subject of ongoing scrutiny after classified National Security Agency slides revealed the existence of government computer software named PRISM. The utility collates data that the companies are required to provide under the Foreign Intelligence Surveillance Act – unless, crucially, it’s encrypted and the government doesn’t possess the key. A tipster just sent in these Nexus One screenshots that supposedly confirm two things: that Google will sell it unlocked and unsubsidized for $530, and that Google will sell it itself. Plus, some other very interesting details. Some of the most important bits of info we extracted (assuming the tipster is accurate, and it seems like he is). Oh, and take a look at our hands on with the device in case you haven’t familiarized yourself with it yet. If you cancel your plan before 120 days, you have to pay the subsidy difference between what you paid and the unsubsidized price, so $350 in this case. Or you can return the phone to Google. You also authorize them to charge this directly to your credit card.